Simple road trip romantic comedy taking the expected route. 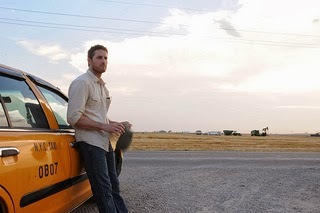 Sam Jaeger as Thom in "Take Me Home". Courtesy of monterey media. She gets in his cab and orders him to just drive, and so he does. The road trip with strangers is the twist to the romantic comedy but it does follow the standard trajectory exactly. When she realizes that he drove them to Pennsylvania, she's mad. He's then mad when she convinces him to drive across the country. It's the classic conflict of interest as well as the classic conflict of class. We can all guess where it's going to lead. There were a number of diversions on the way to California which were mostly welcome because they were often funnier that the staid dialogue. Particularly when they accidentally drove into the middle of the desert without realizing it. Later, in Colorado, Claire wakes up in the cab on a suburban street and Thom is making himself at home. The scene has a good twist (even if you can see it coming) so I won't ruin it for you. The film is able to provide both comedy and drama in that one scene. Unfortunately the rest of the film isn't all that funny or well written. There isn't anything more surprising at the end; and the dialogue, especially at the beginning, leaves a lot to be desired. But that's also why the genre is as popular as it is. It's simple and it works. The acting, direction, and cinematography are all very straight forward which is a good thing as you do end up actually watching the movie.